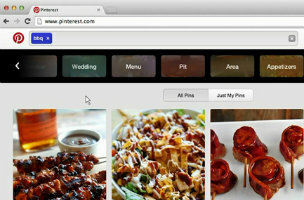 Pinterest unveils guided search for desktop. Twitter restores TweetDeck after hacking. These stories, and more, in today's Morning Social Media Newsfeed. Wednesday, Pinterest announced that it is rolling out its Guided Search feature, something the company has been testing on mobile since April. According to a blog post announcing the news, the feature is to “help you make discoveries and find things you didn’t even know you were looking for.” Mashable Pinterest users will soon see a new search bar when they visit Pinterest.com, and just as it works on mobile, the search features will surface recommended keywords intended to help generate more specific queries and better search results. For example, searching for “BBQ” on Pinterest might surface other keywords like “wings,” “recipes” or “chicken.” The Next Web It’s fairly straight-forward, and to mark the occasion, Pinterest has made its search bar “front and center” for an even faster search experience. When you begin typing in the search feed, you’ll also see a redesigned section underneath that filters results by pins, boards and other Pinterest users. TechCrunch The search bar stretches across the page, while the “Categories” option has been moved off to the right side. Before the change, Categories were often one of the key means for browsing Pinterest’s sections and were found under the “hamburger” menu (the mobile app-like menu with the three lines) at the top-left of the page next to a very small search box. VentureBeat Pinterest is first rolling out the feature in English to everyone in the next few weeks, with more languages coming soon. Twitter plugged a security vulnerability in its popular TweetDeck application Wednesday, after disabling the system for over an hour earlier in the day to fix it. People logged into the service during the breach got odd pop-up messages. Their systems also randomly re-tweeted messages containing potentially malicious computer code scripts. On Wednesday, Google announced the introduction of Google My Business, a streamlined platform for small businesses to use its tools. The platform allows businesses to update their information, add photos, share news and see reviews, all in one place. Good news! A potential customer is checking out your Twitter profile for the first time. This visual from Daily Genius proposes 10 social media mistakes that you’re probably making. If you have no TV ad budget, would all-digital work? Newcastle Brown Ale would argue yes — digital content is just as effective if not more effective. The Heineken-owned beer brand only advertises online, with Facebook as its core platform, and has used its success to get retailers to carry more of its beer when it plans major campaigns on the social network, according to Quinn Kilbury, brand director at Newcastle. “Hope you ladies have a great day! We are all one day closer!” This is the caption under an Instagram post from the Strong Prison Wives account, which has almost 2,000 tight-knit followers with one thing in common: they’re dating or married to someone who’s in jail. YouTube has a new top techie: Venkat Panchapakesan is the video site’s new head of engineering. Panchapakesan had previously headed up engineering at Google’s Apps group.